We will often see athletes in our office who are frustrated and confused by their seemingly inability to recover from problems circulating in the lower abdomen, groin and hip. Long periods of rest, missed competitions, difficult recoveries are all the hallmarks of a patient ready to have a surgery because months of conservative care options are not working. If you are reading this article you likely suffer from a groin pain that wont go away and you are either trying to convince yourself the surgical way is the way to go or you are still hoping to find the non-surgical alternative that will allow you to get back to your sport ASAP. One thing for sure, you are tired of waiting for your groin pain to heal. A typical patient, maybe someone just like you, will come into our clinics and describe to us what is going on. I suffer from chronic and recurring groin pulls and adductor strains. It has been going on for months. I got hurt in a game. I knew right away something was wrong. There was a sharp pain in my groin area. After the injury happened it really hurt to walk. I really struggled with steps. I researched on line and started the RICE protocol (Rest, Ice, Compression, Elevation). I did not realize how poorly this would work. Especially when I tried to play the following week and had to leave the field immediately with an aggravated injury. I shut myself down for a month. Took a lot of supplements to work as anti-inflammatories. Searched the internet for anything that could help. I was stretching like crazy, I bought the best compression shorts I could find and after a few weeks I thought I was as good as new. No pain, running freely. Went out and played. After the game, not much tenderness. No swelling, no ice. THE NEXT DAY, my groin started to hurt again. Not a sharp pain but a dull pain. As the day went on, it got worse. So I shut myself down again for a few weeks but continued with the stretching, the ice, the compression shorts and now I was including heating pads in my treatment plan as well as massage rollers. After a month off I was playing again. I did not make it to the end of the game. The dull throbbing pain was back and I was fearful if I kept playing I would do something more to hurt myself. After 2 months of dealing with this I went to the doctor and asked for physical therapy. At PT I wanted to be more aggressive, the season was ending, I had only played 2 half games in 2 months. My aggressiveness led to another more acute groin pain. Season over. I am here today because I cannot play, and this groin pain does not go away, I need to be ready for next season. If you recognize yourself in this story, you too are feeling frustrated, unsure, and are bouncing from PT to chiropractor to doctor and the bouncing around is aggravating your injury even more. To get to get to your problem, one must identify what your problem really is. In our 26 years experience, we have seen a lot of groin pain that was not ALL groin pain. It was part groin pain, part hip pain, part lower back pain. We have also seen a lot of patients who initially were very pleased that someone had found something that they thought they could treat. The problem was the hip specialist treated the hip, the back specialist treated the back, the groin specialist treated the groin, no one treated you as a whole. Eureka medicine is going to the spine specialist who discovers problems at L1-L2 as says, “Eurkea, we have found something!” Or going to the hip specialist who suspects a labral tear and says “Eureka, we have found something!” Or going to any specialist who isolates on a single problem. If you are like the many patients we have seen, your groin problem is not an injury in isolation, your groin problem is the result of many things conspiring against you. In our clinics, we have seen many patients with a possible low back connection, but we are looking at the undiagnosed, unnoticed problems of the iliolumbar ligament and sacroiliac ligaments. We will discuss this below. In our clinics, we have seen many patients with a possible hip connection, but we are looking at the gluteus medius, piriformis muscle, and iliotibial band not simply a ball and socket problem and an inspection of the hip labrum. Chronic groin pain that will not go away is not something that is usually an isolated problem. You may have a problem with the tendon attachments of the abdominal wall (adductor tendinopathy) or the pelvic region or the hip or spine. This is all called conjoint tendinopathy meaning tendon problems all over the place. and peripheral nerve entrapment (something is pressing on a nerve somewhere, it could be lower back, it could be hip. (This is when surgery is usually called for). To prove this, “it is not one thing,” point, the researchers then examined 100 patients with chronic groin pain: This was the diagnoses they could clearly identify. rectus abdominis muscle atrophy/asymmetry. Your six pack abs are disappearing (number of patients 22). and avulsion fracture of the pubic bone. A bone chip has been pulled off the bone by a tendon tear. (Number of patients 4). The treatment: Surgical management was generally undertaken only after failed conservative therapy of 3-6 months, but some professionals who have physiotherapy (PT) during the football (soccer) season went directly to surgery at the end of the football (soccer) season. The authors of this study believe that athletic pubalgia or sports hernia should be considered as a ‘groin disruption injury‘, the result of functional instability of the pelvis. The surgical approach is aimed at strengthening the anterior pelvic soft tissues that support and stabilize the symphysis pubis. We also agree that strengthening the anterior (front of your body) pelvic soft tissues is the key to healing. Below we will present the non-surgical way we recommend. In some cases, a surgery may be necessary. In some cases, not. You can reach out to our team via email to see what your options can be. So as you can see from the above research, groin pain can be many things, treated many ways. Does this knowledge help your situation? It helps your situation if you can be treated non-surgically with regenerative medicine injections such as Prolotherapy which can be used to address multiple problems simultaneously without surgery. We will discuss this below. In May 2018, in research lead by the Department of Orthopaedic Surgery, Drexel University College of Medicine and published in the Orthopaedic journal of sports medicine (2), researchers offered this suggestion to team physicians and the athletes suffering from groin pain that they should include an examination of the hip in determining best treatment options. In simplest terms, your groin pain is not healing because all the damage is not being addressed. Above we spent a lot of time talking about muscles and tendons. Now we will talk about the ligaments. The strong, rubber bands like tissues that connect your bones to each other. We will now discuss how your hip ligaments maybe the cause of the groin pain that you have that will not go away. How is this happening? An unstable hip causes unnatural hypermobility in the pelvic, hip, low back, and groin region. This unnatural over movement in the hip causes stress on the abdominal wall, the pelvis itself, the ball and hip of the joint, teh SI joint and the lower back. To reiterate the point of this article, groin pain that does not go away is being caused by something that prevents you from healing. It is usually not one thing. 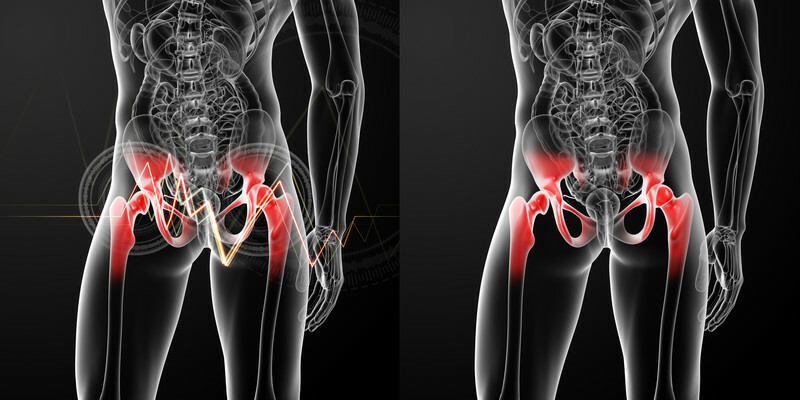 Hip instability may commonly manifest itself as groin or inguinal pain. 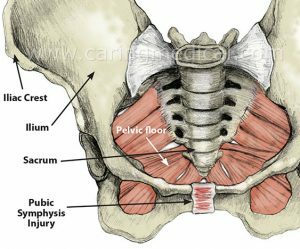 When a patient asks why they cannot heal, we explain to them that someone suffering from groin pain should be examined at the pubic symphysis, and groin pain generators should be explored in the sacroiliac joint, iliolumbar ligaments. A complete examination of the hip joint and its range of motion is also needed. Below you will see research explaining how doctors can determine treatment courses based on the hip range-of-motion. When the hip joint becomes unstable, the hip muscles compensate for the instability by tensing. You get muscle spasms. As is the case with any joint of the body, ligament instability initiate muscle tension in an attempt to stabilize the joint. This compensatory mechanism to stabilize the hip joint eventually causes the gluteus medius, piriformis muscle, and iliotibial band/ tensor fascia lata muscles to tighten because of chronic contraction in an attempt to compensate for a loose hip joint. The contracted gluteus medius can eventually irritate the trochanteric bursa, causing a trochanteric bursitis. A bursa is a fluid-filled sac which helps muscles glide over bony prominences. Patients with chronic hip problems often have had cortisone injected into this bursa, which generally brings temporary relief. But this treatment does not provide permanent relief because the underlying ligament laxity is not being corrected. Here again, there are many factors that come into play when addressing groin pain. Loose ligaments in the hip that allow for hypermobility of the pelvis cause a myriad of problems for you as mentioned above. Many people and clinicians believe that it is all about stretching, stretching, and stretching some more. At some point stretching becomes harmful. Some clinicians believe that core muscle training is the answer. For many people these therapies are very beneficial. Stretching and massage feels good to people with chronically “tight iliotibial band or IT bands.” They have not, however been beneficial in your case. A point of understanding our attention to the ligaments: The tendon bands/muscles become tight because of hip instability. This instability needs to be properly identified and treated for the chronic tightness to be eliminated, along with the need to regularly stretch or massage the area in order to feel relief. Once the joint becomes stable, the continual tightness subsides. What does this mean to you? Treating range of motion with physical therapy can help, but not always, PT should not be the only intervention as it may not benefit you. Research from another team of Dutch researchers and published in The Journal of sports medicine and physical fitness (4) says that soccer players with groin injury refrain from kicking with maximum strike force because of previous groin injury related to decreased hip range of motion. The thinking is come up with a kicking kicking strategies for athletes with injury, or in our thinking, come up with a better way to repair the hip-groin damage. Now we are going to further look at why adductor muscle strength is not fully repaired with exercise and PT. University researchers in Spain and Canada teamed up to examine the unique problems of hip-groin injuries in tennis players. Writing in the medical journal Musculoskeletal science and practice, (6) they examined groin injury risk factors, such as hip muscle strength in tennis players with a history of previous high-groin injury. Sixty-one tennis players completed this study: 17 in the hip-groin injury group and 44 in the NO hip-groin injury group. Isometric adductor and abductor hip strength were assessed to include jumping ability. RESULTS: Isometric adductor weakness and adductor/abductor strength ratio deficits suggest that adductor muscle strength is not fully recovered in these athletes, potentially increasing their risk of a repeat groin injury. Physical therapy is failing because the muscles are not strengthening. What is causing this? In our article: Why physical therapy and exercise did not work for your hip osteoarthritis or tendinopathy pain, we wrote about tendon weakness causing limited strength resistance and preventing muscles from attaining a full workout benefit. In our article: Greater trochanteric pain syndrome, we discussed how researchers now believe that injuries to the muscles and tendons around the hip are the actual cause of Greater trochanteric pain syndrome in the hip and its relationship to groin pain. In our article: Gluteus Medius Tendinopathy we talk about when the hip joint region becomes unstable, the muscles, including the Gluteus Medius, tries to create stability by tensing, cramping or going into spasm. When the muscle tenses, you have “pull” on the tendon. If the tendon is damaged, it will be very painful. When this patient comes into our clinic, we talk with them about the difficulties in isolating one part of the pelvic-hip-spine complex as the main culprit of their problem. This we find especially true in treating a patient with problems of Gluteus Medius tendinopathy. If physical therapy and exercise has failed you in your recover, you need to assess the entire hip, spine, pelvic, groin complex. Next, Do you need a spinal surgery for your ligament related groin pain? No! You have this chronic groin pain and the doctor is suggesting that the problem may be from your lower back. This includes the possibility that sciatica may be involved. Sciatica can be a long-term or chronic pain that is felt over a wide area below the buttocks, its origins lie with injury or disruptions of the discs of the lower back. When the lower back is suspected, usually an MRI is called for. If the MRI shows some abnormalities in the discs, quickly and possibly without merit, a sciatica problem is identified. But are you chasing the wrong thing? What does without merit mean? This means the problem may not be the sciatica at all and the MRI is sending you down the wrong trail. See our article Prolotherapy sciatica treatments. Häggström, Mikael (2014). “Medical gallery of Mikael Häggström 2014”. WikiJournal of Medicine 1 (2). We find that patients suffering from so-called sciatica often have weakness in the sacroiliac joint, hip joint, sacrotuberous and sacrospinous ligaments, trochanteric bursa, and iliotibial band/tensor fascia lata. 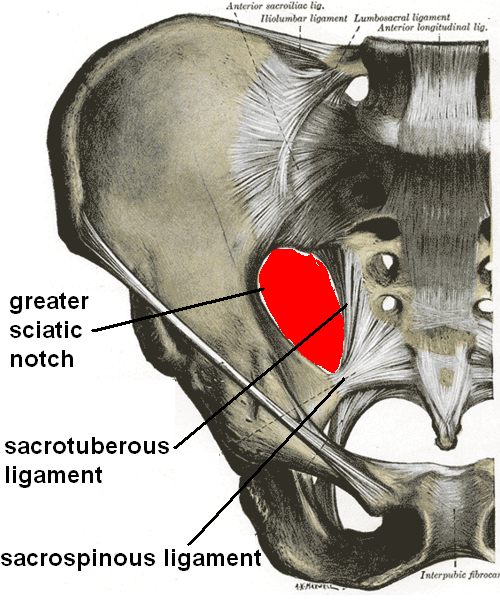 The sciatic nerve runs between the two heads of the piriformis muscle. 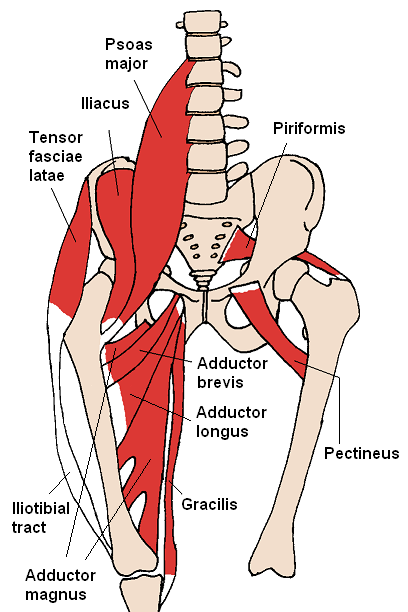 When the piriformis muscle is spastic, the sciatic nerve may be pinched. Piriformis syndrome centers on the piriformis muscle as it rubs on the sciatic nerve causing irritation. Lumbosacral and hip joint weaknesses are two main causes of piriformis muscle spasm. Stretches and physical therapy directed at the piriformis muscle to reduce spasm help temporarily, but do not alleviate the real problem. Injuries to the hips and core muscles are frequent in athletes. Getting an accurate diagnosis and proper treatment of groin pain can be challenging for trainers and physicians. Clinical presentations of the various hip problems overlap with respect to history and physical examination. A distraught parent brought his son, highly touted baseball prospect, into our office. His baseball career was abruptly halted when chronic groin pain occurred. He was told it was a hernia, so he followed the doctor’s advice and had surgery for it. That didn’t help. They next told him it was caused by an iliopsoas muscle strain. So he worked with various therapies to relieve the muscle strain. Those did not help either. His back was finally x-rayed, where they found some degenerative disc changes. At this time, the team doctor began talking surgery. The athlete had significant tenderness over the pubic symphysis, which was expected. His iliopsoas muscle was also very tender and he had some degenerative changes in the lower lumbar spine on MRI. The joints beneath the iliopsoas muscle are the hip joint and the lumbosacral junction where the degeneration was located. Palpation of the hip joint did not produce pain, but a positive jump sign was elicited at the iliolumbar ligaments, lumbosacral ligaments, and sacroiliac ligaments. Many athletes are subjected to hernia surgeries for groin pain, which has nothing to do with a hernia. We have bailed out many a surgeon who referred patients to us (or the patients came on their own) after the hernia surgery failed to “cure” them of their groin pain. Groin pain coming from an iliolumbar ligaments injury or dysfunctions at the thoracolumbar junction, may at times be mistaken for hernia injury. Athletes are again cautioned to rule out all of the possible causes of groin pain, and consult a doctor who performs Prolotherapy when such symptoms are present. Prolotherapy involves the injection of a small amount of solution into multiple painful ligament and tendon insertions (enthesis), typical trigger points, as well as into the adjacent joint spaces to induce healing of the injured structures. It is presumed to work by stimulating weakened structures such as ligaments and tendons to strengthen, tighten and heal by the induced proliferation of cells. When you come into our clinics for an evaluation for groin pain that does not heal, in addition to looking at the various problems that we have described above, we also examine the pubic synthesis or the pubis (on of the bones of the pelvis) and its ligament attachments. There are a lot of soft tissue that attaches to the pubis including tendons and muscles. Abdominal muscles attach there so lower abdominal pain can be misdiagnosed as a hernia problem when it is a public symphysis problem. There are various ligaments including the superior pubic ligament that attaches pubis bone. In 26 years of clinical experience, we have see Prolotherapy provide excellent results for groin pain as it relates to the various soft tissue and instability problems we have already described in this article. In the Archives of physical medicine and rehabilitation,(7) doctors including K. Dean Reeves, MD., reported on Prolotherapy given to 24 elite kicking-sport athletes (soccer and rugby) with chronic groin pain on average for 15 months from osteitis pubis and/or adductor tendinopathy. Monthly injections were given into the enthesis around the symphysis pubis. Twenty of the 24 patients had no pain and 22 of 24 played their sport without restrictions. This article is part of a series of articles on groin pain in male athletes. Please see Pubic symphysis injury in Male Athletes does this ever heal?